Useful information about emerging categories is often tough to come by. It’s typically fragmented across a variety of views and experts. My search for useful information about paid crowdsourcing technology vendors has been no exception. 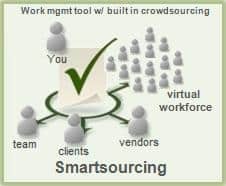 Several months ago, I published a list of crowdsourcing technology vendors. Within about a month, it had reached the number 1 position in natural search. It was a fairly rudimentary list, but apparently, it was the best current accumulation. For all those that have been searching for consolidated information for the on-demand workforce market, we’ve created two new sources for your consideration. We’ve greatly enhanced the existing list with more vendors and more vendor characteristics. And, we’ve compiled a full report on the vendors and progress in the space over the past 10 years. The list is open to all, the report is free to those that sign up and attend our Sept. 17, 2009 online event. It’ll be $200 a copy after that. Here’s the link to the enhanced list, and here’s a few columns of the data resident within it. Enjoy. another interesting crowdsourcing vendor is UserTesting.com. They crowdsource usability testing for websites and record the sessions at a low fee. You should also consider www.squadhelp.com for business naming. This site leverages the "wisdom of crowds" allowing users across the world to submit domain name suggestions. The best suggestion wins a prize that is setup in advance by the contest holder, creating a win win situation for every one. Contests can start as low as $35.